A longstanding retail provider of top brand luggage, briefcases, backpacks, handbags, duffels, and travel accessories. 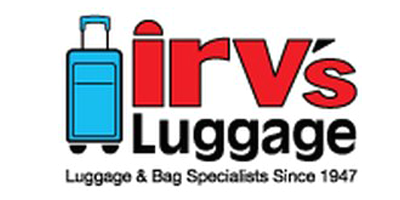 Irv’s Luggage has been a great value in the luggage business for more than 65 years. There are many well-known brands to choose from with coupon deals on brands such as Samsonite, Kenneth Cole, The North Face, Eagle Creek, High Sierra, Big Buddha and Tano. Made in USA Rawlings Leather Goods On Sale through this link! Browse Heys America luggage - hard side, spinner, kids, carry-on and more! Free Monogramming on Leather Padfolios through this link!